It's springtime: the birds are chirping...and my dog is chasing them. Oh, and asparagus is EVERYWHERE! 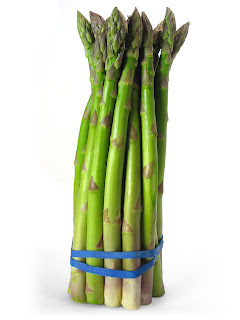 I have been asked a couple of times this week about the best way to store asparagus and how to pick out the best spears. Myth: skinny spears are the most tender. 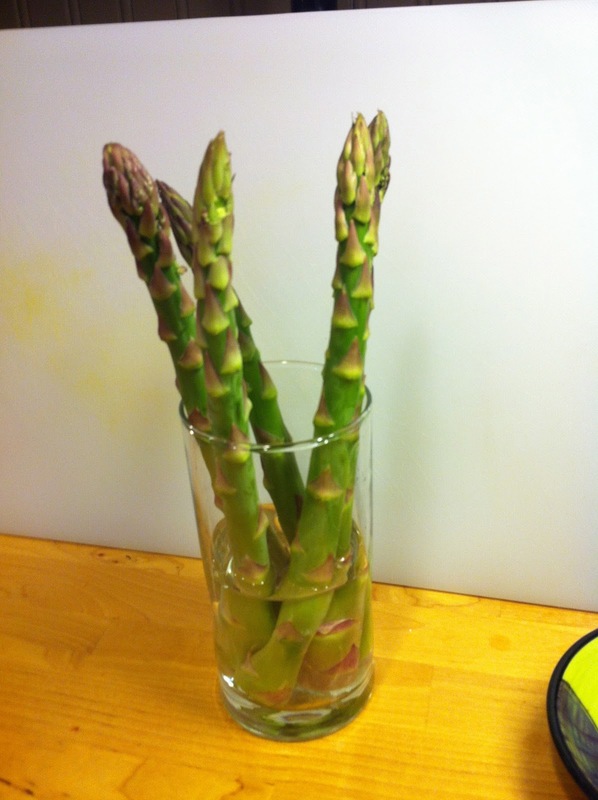 Tenderness has to do with the growing conditions and maturity of the asparagus plant. Fat stems are fat when they poke out of the ground and thin ones, thin. Instead of using size to dictate tenderness, look for firm, straight stems with tight crowns. In terms of diameter, choose what you like or what would look best with your dish. You can estimate how much yield you’ll get from the bunch of asparagus by grabbing the stem end and midway up the spear and bending it just before the point of snapping. The closer to the stem the snap looks like it will be, the more yield you’ll get from your asparagus and (likely) the more tender the stem, however this depends a bit on how the asparagus was harvested as well. Finally, asparagus grown in cooler weather tend to be tougher since they grow more slowly and have more time to develop fiber/woodiness than those grown in warm weather. Nerd factor: Grading of asparagus. Asparagus are graded based on diameter as measured 9-inches down from the tip. Like any vegetable purchase, it is best to use them ASAP, preferably within a day or two. 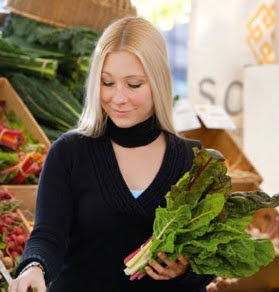 However, life happens and few of us have the luxury of going to a gorgeous farmer's market to buy freshly picked produce on a daily basis. If this describes you, don't fear. Cut an inch or so off the end of the stems and place them immediately into an open glass or container with an inch or two of cool water in it. Put the container in the refrigerator. As an experiment, I tried this over a week ago. The remaining asparagus are in the picture below. They are still perfectly crisp and delicious. They're also tender despite not being skinny (just to prove the point above). Last night, a few victims were part of the filling for potstickers. So good!